​As we discussed last entry, the main (though not only) reason that the Spanish explored portions of what is now the United States was to search for further wealth and success to mirror what they had found in the conquests of the Mexica (Aztec) and Incan empires. By the early seventeenth century, such dreams had been abandoned. So, then, why did Spain still colonize so much of what is now the United States? We can look to two major reasons, which aren’t always easy to separate. The first was the concern for Native American souls. The second one had to do with imperial security. Let’s look at the first reason first. Even if no material wealth could be found, there was still a large “harvest of souls,” as one Spanish priest called it. Having preached the gospel to native groups and having baptized many (what the Native Americans meant by submitting to this ritual is not always clear), Spanish clergy now considered many Native Americans in what is now the United States to be Catholics for whom they were responsible. There was also the hope that other native groups could be reached, as well. Missions dotted the landscape in New Mexico, Arizona, Florida, Texas, and (much later) California. We talked a bit in a previous entry about the role that missions played in the overall colonization plan for Spain’s New World Empire. It is worth repeating, though, that the goal was not just to make Catholics, but also good Spanish citizens. That meant enforcing what the Spanish considered to be “civilized” behavior. Spanish efforts at conversion and civilization could be quite severe, as priests tended to view Native Americans how we might view unruly young children. It didn’t help matters that Native Americans living at missions often did so involuntarily (this is especially true in California). Clergy officials also sought to control all aspects of the lives of mission Indians. This could even include things like locking up men and women in separate dormitories at night—much like an overly anxious youth pastor might do at summer camp! Corporal punishment and sexual abuse – by both soldiers and clergy--were also not uncommon. With the Christmas season over and a new year’s routines taking hold, I should be back on a regular schedule of posting a new entry toward the beginning of each week. We left off in the middle of a series of entries discussing the Spanish influence on what would become the United States – an influence that began around a century before Jamestown. We started the story in Central and South America, however, because what happened there is what convinced the Spanish to head north. The conquest of the Mexica (Aztec) and Inca Empires gave immediate credence to other rumors about lost empires or “cities of gold” just waiting to be found. And there were plenty of rumors to chase! Some rumors may have been a matter of misunderstanding or misinterpretation. However, many seem to have been intentionally misleading on the part of Native American groups. Think about it: a group of people with a bad reputation who make pretty outrageous demands (as we’ll see later this entry) show up in your area. You’re going to try to find a way to move them along as quickly as possible, right? And when you find out they’re looking for gold, silver, etc … well, is it really that surprising that Spanish conquistadors kept hearing stories about vast amounts of gold waiting just beyond the horizon? Better hurry and go find them! No reason to stay here! We’ll look at a few of these expeditions into what is now the United States next. ​If you’ve heard much about the Spanish in the New World, you’ve probably heard the phrase “God, Glory, and Gold.” While no catchphrase can fully capture the complexities of a historical topic or period, this particular phrase is a pretty good place to start, nonetheless. So, let’s look at “God,” “Glory,” and “Gold” in turn as the basis for a brief introduction to the Spanish New World Empire. As we discussed in a previous entry, the Spanish had just completed the “Reconquista,” toppling the last Muslim kingdom on the Iberian Peninsula in 1492. Probably any European power at the time would have assumed that God was with them in such a struggle, but the Spanish believed that God had manifested his favor in various concrete ways throughout the reconquest. For example, some Spanish soldiers reported seeing St. James fighting on a white horse during several key battles. Then, just as the Reconquista wrapped up, they became aware of an entirely new world. The timing was further evidence for many Spanish of God’s overwhelming favor toward the fledgling kingdom. Thus, “God” was very much a motivation for Spanish activity in the New World. 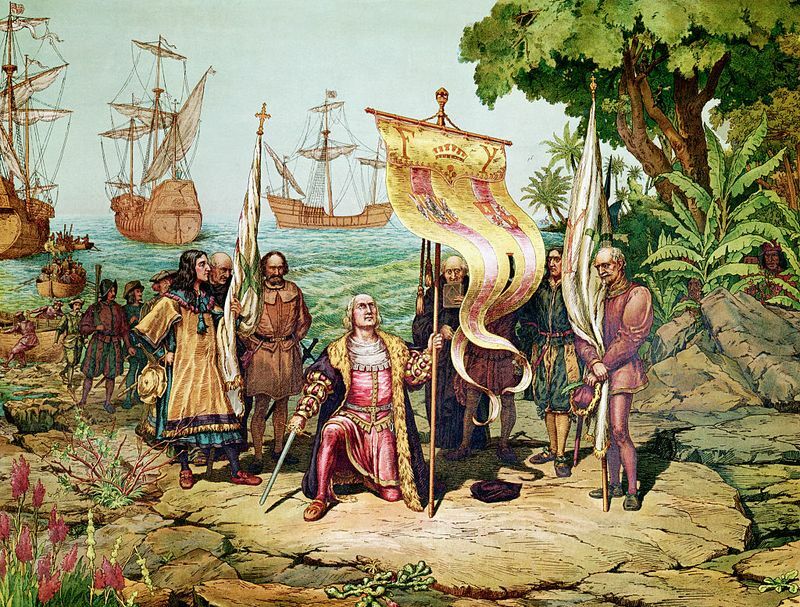 Spanish clergy of multiple religious orders headed to the New World to convert Native Americans, hoping to create both good Christians and good Spanish citizens. 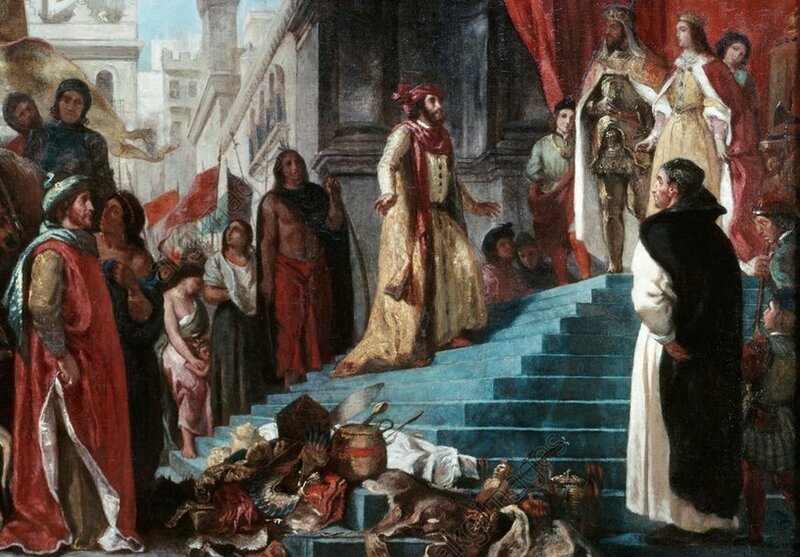 As a reward for driving Islamic powers from Western Europe, Spanish monarchs got to nominate their own choices for church officials within their New World empire; the pope essentially rubber stamped these choices. This meant that in the New World, Spanish missionaries were as much agents of the Spanish Crown as they were of the Catholic Church. While missionaries worked with secular authorities to some extent in all European New World empires, the relationship between the two in Spanish territories was particularly intimate. ​Permanent connection between “Old” and “New” Worlds would revolutionize life on both sides of the Atlantic. 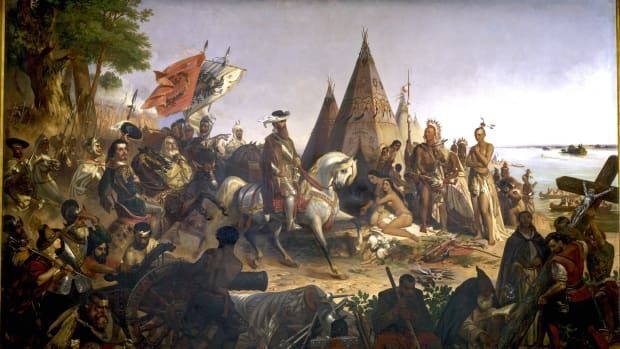 The easiest way to conceptualize the consequences of this permanent connection, especially early on, is to talk about something historians call the Columbian Exchange. The Columbian Exchange refers to the transfer of population, disease, plants and animals, technology, and ideas between Old and New Worlds. We don’t cover all of these in detail today, but let’s look at a few of these categories below to get a better idea of how revolutionary permanent connection really was. The Columbian Exchange led to both sides of the Atlantic encountering plants and animals entirely unknown to them. Europeans encountered turkey, corn, strawberries, watermelons, potatoes, tomatoes, and chocolate—just to name a few. Meanwhile, Native Americans encountered sheep, pigs, horses, cows, rice, apples, and oats – again, just to name a few! Looking over that list, it’s not hard to see how important the exchange was. Imagine the Comanche or the Sioux with no horses! Imagine Italian food with no tomatoes, or the course of Irish history with no potatoes! In short, encountering new plants and animals could be radically transformative. It could also be destructive at times, as Cherokee farmers discovered when English pigs ran rampant through their corn fields. The Columbian exchange could also mean encountering new ideas. A good example of this is Native American encounters with Christianity. It’s important to remember that “conversion” is a process that can look very different in various cultures and in various historical periods—even for different individuals within the same culture! So, just because we see groups or individuals in history identifying with Christianity in some way, it doesn’t mean that they always understood this commitment in the same ways that we might as twenty-first century Americans – not that twenty-first century Americans all understand it in the same terms, either! ​As we discussed in previous entries, Western Europeans initially took to the ocean to regain access to Asian trade goods. Portugal accomplished this first, then Spain took a risk that Columbus just might have found a way to do it, too. Further explorations after Columbus’ voyages eventually made it clear that what Columbus originally stumbled across was not a series of unknown islands off the coast of Asia … but a new landmass completely unknown to (or, perhaps we could say “completely forgotten by,” in light of the Vikings’ earlier voyages) Western Europe. This begs the question: why did Western Europeans keep coming back? If it wasn’t Asia—and thus could not provide the silks, spices, etc, craved by Europe—why did Western European nations continue to explore, conquer, and colonize this “new world”? It might seem like an odd question, but Europeans needed a reason to return. They naturally occupied a world in which Europe and Europe’s needs were at the center. Even when their New World colonies had become quite prosperous (as we’ll see later in our series), European countries continued to think of North and South America in terms of how they could meet Europe’s needs. Eventually, this feeling of being perpetual second-class citizens in global empires would help lead to revolutions throughout the New World – first among the Atlantic seaboard British colonies, but eventually among the Spanish colonies from Mexico down through South America, as well. More on that later down the line! Eventually, we’ll look at the actions and experiences of individual European New World Empires—not to mention the actions and experiences of the New World indigenous nations who don’t exactly just disappear in 1492! But for this entry and the next, let’s stay fairly broad and “big picture.” Today, we’ll examine several general reasons why Western Europeans saw such promise in the Western Hemisphere. ​Whenever I teach the early part of American history, I ask my students: how many of you were taught in school that no one would support Columbus because people thought the world was flat, and that he would sail off the edge? 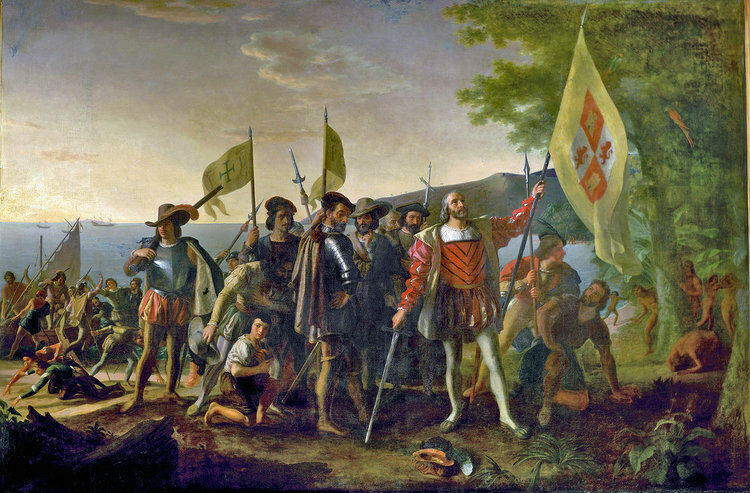 Fortunately, less and less students raise their hand each semester, but this misunderstanding remains central to how some Americans remember Columbus. The truth, however, is that it was well known that the world was round. It was Columbus’ calculations, not his decision to sail west to reach Asia, that scared people off. Sailing west was in and of itself a great idea; it would completely bypass the Portuguese choke hold on trade with Asia. The problem? What Columbus proposed wasn’t possible. In believing that the globe was much smaller than it actually was, Columbus grossly underestimated how far he would have to travel west to reach Asia. 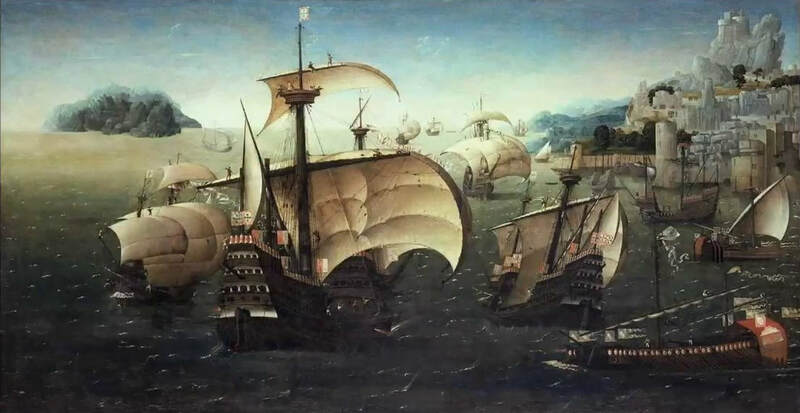 Experts at the time rightly understood that no ships existed that could store enough supplies to survive such a long trip across the open sea. In fact, Columbus was literally thousands and thousands of miles off in his calculations. If not for the existence of North and South America, he would have died at sea. So, if Columbus was wrong, and experts in every European court (including Spain’s) knew he was wrong … why did Spain eventually agree to sponsor his journey? Well, to answer that question, we need to go back a bit and talk about something called the Reconquista, or Reconquest. ​By the late 1400s, Western Europeans had everything they needed to start building a new world centered on the Atlantic Ocean – a world in which Western Europe would begin its multi-century climb from being a cultural and political backwater region to dominating the globe. Contact with China had given them paper, gun powder, and the inspiration for block printing (leading to the invention of the printing press in Germany in the 1450s). 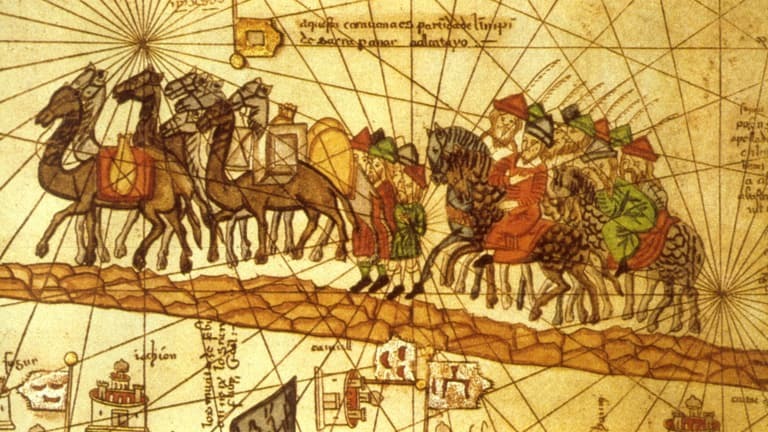 Contact with the Arab world (largely via the Crusades) had given them new sailing technology, awareness of a new cash crop (sugar), and renewed access to many ancient Greek and Roman writers, whose writings had been preserved by neighboring Islamic empires. Meanwhile, new techniques developed inside Europe meant that iron and steel could be produced in vast quantities of good quality. In short, Western Europeans now had the ability to map and navigate the globe in new ways (people knew the world was round), they had new ships capable of sailing longer distances and in more dangerous waters, and they were starting to acquire the military superiority needed to build and maintain trans-Atlantic empires. ​Last week we discussed how the ancestors of today’s Native Americans had to make drastic adjustments in light of the disappearance of megafauna. 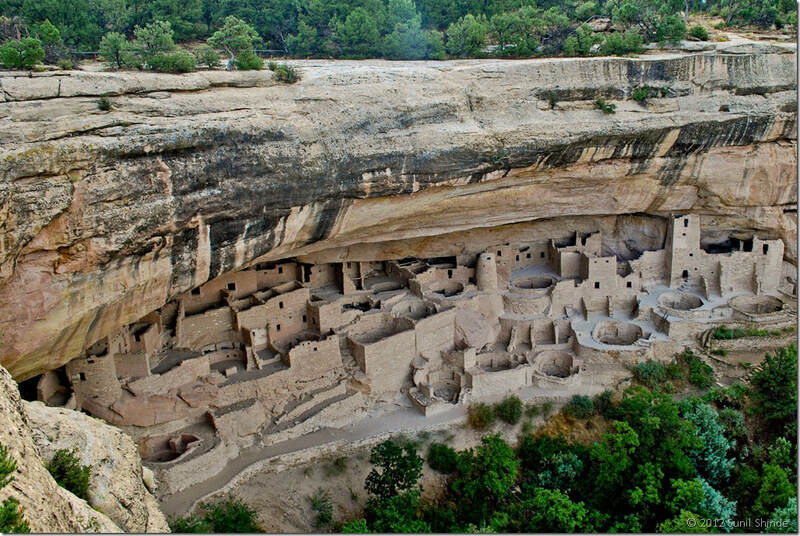 As these communities adapted to local environments, they produced a remarkable array of new ways of life. This doesn’t mean that these new local communities developed in isolation from reach other. We have evidence of continent wide trade networks crisscrossing North America during this time period. Nonetheless, the ancestors of today’s Native Americans showed remarkable ingenuity and creativity in adapting to new localized existences. Today, let’s take a whirlwind tour of the continent, so that you can get an idea of how the peoples of North America lived on the eve of contact with Europeans. In the Pacific Northwest, Native American cultures mostly developed around the hunting of salmon and other marine life. Because of the overabundance of local food sources, intensive agriculture was not part of the life of these communities—though they certainly gathered local plants for their own purposes. Instead, they focused their efforts on “farming” the sea, developing cultures centered on rituals and ceremonies related to fishing and seafaring. Communities in the Pacific Northwest could grow as large as 2000+ members, leading to significant population density throughout the region.